The Burns Family Classroom is available for rent for your workshops, readings, receptions, and other events. To look into availability or to book the classroom call (204) 944-8013. This versatile room can seat 40 (with seating for up to 26 at tables for workshops) and is equipped with a video projector, sound system, wi-fi, DVD player, microphones, movable desks and chairs, a refrigerator, microwave, coffee-maker, kettle, couch, wall chalk board, and large windows that offer a generous amount of light. Rental rates are $70 for up to 4 hours or $140 for a day. Email info@mbwriter.mb.ca to check availability. Two studios will be available in the Artspace Building for one year or 6 month contracts commencing January 1st, 2012. Monthly rent is $100. A desk and chair are provided. If you are a member and are interested in renting a studio please contact us: info@mbwriter.mb.ca or (204) 944-8013. One of the most valuable assets a writer can have is a room of their own to ruminate, contemplate, and be creative. 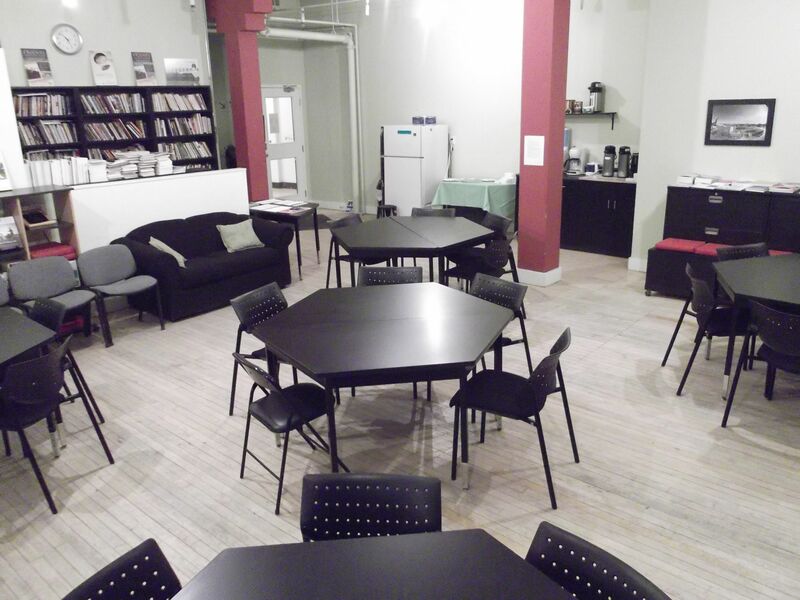 The Manitoba Writers’ Guild understands just how important a creative space is to the writing process, so to address the needs of our members who cannot find the space themselves, the Guild offers two writers studios in the Exchange District’s Artspace Building, 100 Arthur Street. Studios are only available to members of the Manitoba Writers’ Guild and are booked on a first-come-first-served basis. The MWG charges a monthly fee of $100 to use the space. Typically rooms are contracted our for a one year or six month period. The studios are always in high demand with a small waiting list. Writers’ Studios • The MWG writers’ studios are currently occupied until further notice. If you wish to be placed on the waiting list please contact the MWG offices with your request.